Classically designed angels, faerie, elves, pixies, and cupids, all with an authentic look of yesterday. Variety of poses and settings, including a four panel version of the four-seasons. 36 pages, 4 in color. 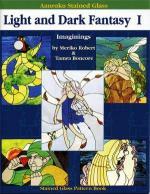 A treasury of imaginative stained glass designs that contains a host of fantasy figures. Attractively displayed in circular, oval, and rectangular configurations are 69 striking, black and white images of delicate fairies, fire-breathing dragons, half-human figures, a unicorn, phoenix, and other fanciful creatures. Make your fantasies come true, using this 36 page pattern book filled with mythical creatures like, Pegasus, Garden Gnomes, Centaurs, Singing Harp and more. Each design comes with special instructions and full color illustrations. 26 patterns of mystical and magical creatures of the light and the dark! Patterns include fairies, a dwarf, a minotaur, a dryad, a leprechaun, a gryphon, Pan the God of Nature, dragons, a gargoyle, Pegasus, a witch, a mermaid, a phoenix, a wizard, a vampire, a centaur, an elemental, a skull with candle, a harpy, a unicorn, a grim reaper, and a greff. This collection of 40 stained glass panels illustrate the legends of love, adventure, exploration and conquest. Every project includes the pattern line drawing. 24 projects shown in color, 16 rendered as a textured line drawing with color ideas. 2 designs are provided as full-size patterns. For centuries cultures from the Navajos to the Hindus to the Celts have used the mandala as a form of creative expression. A sacred symbol meaning "universe" or "wholeness", the mandala is a complex circular image that uses patterns and geometric designs to draw the eye to its center, creating an appeal that's almost hypnotic. These 99 designs put a modern spin on an ancient symbol and provide inspiration your projects, windows, and suncatchers.